Halloween is here again and for some spook-tacular fun for the whole family, head to Legoland Malaysia Resort to enjoy Brick-or-Treat Party Nights. parties or let them bid you farewell with a zombie dance! Only for this season, park hours will be extended to 8.30pm on Brick-or-Treat Party Nights (Friday and Saturday) with a party programme that starts from 4pm at only RM85 per guest. In the tradition of dressing up in costumes for Halloween, kids who come dressed in interesting outfits, get to enter the park for Free! Your Brick-or-Treat party starts with being welcomed into the park by a host of zombies in the Monster March. So have fun identifying ghoulish characters like the Mummy, the Mummy’s Bride, a giant bat and even a pumpkin-headed scarecrow! The fun begins at the Lego Kingdom where children can enjoy a terror-fic interactive time in the Monster Mayhem Catcher show featuring Lego characters, Lord Vampyre, Green Witch and Frankenstein. Come early to get your face painted with creative designs and join the classes set up to guide you in designing your own Magic Cupcakes and making Potion Drinks to bind your friends in spooky spells! Then go on the Brick-or-Treat Trail with ten stops to complete a Halloween activity at 10 huts along the trail. Among the activities, have fun finding hidden Lego bats, laughing your loudest (and scariest) with the Witch, helping Lego spiders find their home, take part in the Lego ring toss and Mummy bowling and don’t forget to take a trek through Lord Vampyre’s Ballroom Maze to count the number of creepy crawlies you meet along the way. At the end of your trail, you will be rewarded with a limited edition Halloween commemorative brick. When the sun sets, join the Spooky Miniland Tour where guests can enjoy Lego fun facts in fascinating story-telling sessions at selected clusters. Legoland Hotel also offers Halloween Day & Night hotel promotion packages that include accommodation, breakfast and dinner as well as park activities. Hotel guests will also enjoy Halloween activities in the hotel. These include Lego colouring, Witch Catch Speed Building Challenge, Ghostly Bowling, Three Magic Witches musical performance, Little Chef Pastry Making sessions and a host of fun activities. The hotel promo package is for bookings made from now till Oct 30 and for stays from now till Oct 31. Halloween Brick-or-Treat Party Nights are happening on Fridays and Saturdays in October 2016, on dates 7-8, 14-15, 21-22 and 28-29. Brick-or-Treat Party Night tickets are RM85 per person. For this season, Legoland Annual Pass Holders may bring a friend at only RM70 per person. Buy three day tickets on-line to enjoy one free ticket while Maybank Card Holders will get 25% off Halloween tickets bought at the ticketing window. For more information on promotions and activities on Brick-or-Treat Party Nights at Legoland Malaysia Resort, visit www.legoland.com.my and stay connected via social handles, Facebook and Twitter, for more online Halloween promotions. Clear skies, puffy clouds and bright sunshine – perfect weather for outdoor fun when Spritzer Slide the City was in Johor Baru last weekend. The terrain in the park at Hutan Bandar MPJBT, which features natural rolling slopes, was an ideal site to hold a weekend carnival of wet and wild fun for all the family. Organised by Monkey Theory, an international event management company, and title sponsor, Spritzer, Slide the City is a 3-lane water slide playground that originated from the United States. Since its debut in the US in 2013, Slide the City has developed a huge worldwide following. More than two million people in major cities like Japan and Hong Kong, as well as Kuala Lumpur and Kuantan, have thrilled to the experience. And now folks in the South also had an opportunity for fun on this wet and wild ride. even a selfie stick to capture shots of their slide ride! “Initiating something like Slide the City, which has never been done in Malaysia, certainly came with its own challenges but we truly believe Malaysians would enjoy such a unique event,” said founder and chief executive office of Monkey Theory, Leong Delon. “It’s a real joy to introduce Slide the City to different cities in Malaysia as we would love to make this event accessible to as many people as possible,” he added. In line with the company’s Corporate Social Responsibility programme, Spritzer Slide the City in JB invited 60 children from local orphanages and care homes to enjoy an unforgettable sliding experience. The slide ride was operated in two “waves” – one in the morning and the other in the afternoon – to allow different groups of people to enjoy the slide. Besides providing fun and games, the organisers gave top priority in the participants’ safety and responsibility towards the environment. In this regard, the waterslide was designed with safety in mind and minimal water loss in their use of recycled water. The entire experience was organized in an orderly fashion for maximum safety and fun for everyone. Some 5,000 people, made up of students, parents with young children, adults – both local and from abroad – enjoyed the Slide experience throughout the day. Each slide participant was tagged with a wrist band and armed with an inflated tube and water-gun before they were directed to the starting point. At the entrance to the starting point, participants – identified by the different coloured wrist bands – had to pause to have their wrist bands marked to record the number of each ride and set a limit to the rides were entitled to. This was to ensure that everyone would have a turn to enjoy that wet and wonderful ride! Excellent teamwork during the tug-o-war challenge! During the midday break, after everyone had a rest and snacks from the food trucks, a massive tug-o-war was organized on a field and participants were roped in from anyone who was just game for some fun. It was a game of teamwork and encouragement as passers-by and total strangers played their part to cheer the participants on as they exerted their might to pull and tug the rope together! The carnival atmosphere was enhanced by various other fun activities like a children’s paddle pool and a Dunk Me! game where participants sat on a seat and risked being dropped into a trough of water when players hit the target which in turn tipped that seat! Participants whose clothes were soaking wet from the slide or dunk were not overly concerned because the scorching sun and balmy breezes dried them off quite quickly! With Spritzer as the title sponsor, Spritzer Slide the City Johor Baru was jointly sponsored by official sponsor GoPro and Le Pure Beauty & Spa with social media partners, Hype Malaysia, TanTan News and Siakap Keli while the official hotel partner was BZZ Hotel. 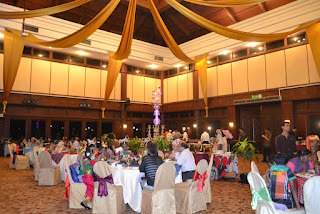 The event was supported by Tourism Johor. 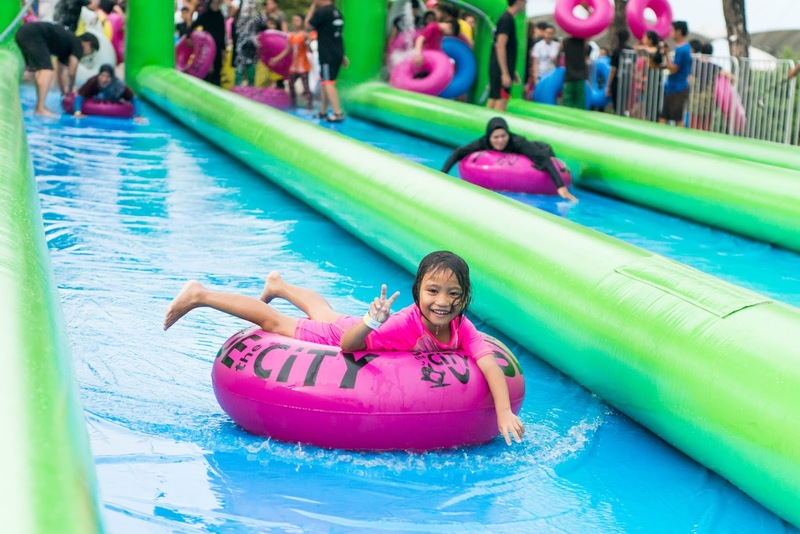 For more info on Slide the City Malaysia, visit Facebook page at: http://www.facebook.com/slidethecitymalaysia/. 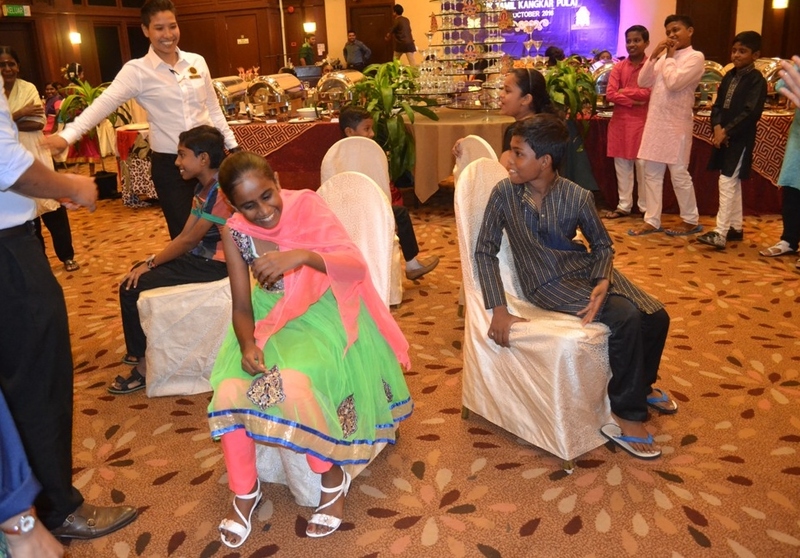 Pulai Springs Resort recently held an early celebration for the Hindu festival of lights or Deepavali with 25 children from underprivileged families in their neighbourhood. Aged between seven and 12 years old, these needy children were identified from Sekolah Kebangsaan (Tamil) Kangkar Pulai and are recipients of food supplements under the Rancangan Makanan Tambahan government scheme. This festive charity dinner was part of the resort’s Corporate Social Responsibility programme in giving back to the less fortunate in the community. Accompanied by their parents, family members, guardians and teachers, the children came dressed in traditional Indian costumes to enjoy the celebration at the resort. These guests were warmly welcomed by the resort General Manager, Sunny Soo and chairman of the resort’s Sports & Welfare Club, Mohd Najib Sedik, on their arrival at the Dewan Inderaputera, event hall. The children came prepared to celebrate their festival and the mood was enhanced by a solo Indian traditional dance at the start of the event. “Our team believes in the spirit of sharing and caring, especially during festive occasions when children need more love and attention,” said Soo who emphasized how the resort aims to join the less fortunate in their Deepavali celebration. “This Deepavali celebration is an annual event and the resort looks forward to celebrating many more occasions with the underprivileged and to share our success with them,” he added. To this end, the resort had prepared goodie bags with essential items to help ease the burden of poor families in preparing for the coming festive season. Each family received food items like rice in 5kg bags, wheat flour, muruku flour, sugar, cooking oil, condensed milk and rice vermicelli. In the tradition of Malaysian festivals, Soo distributed Deepavali money packets of RM50 to each child. This sum was jointly contributed by the resort and it’s Sports & Welfare Club. 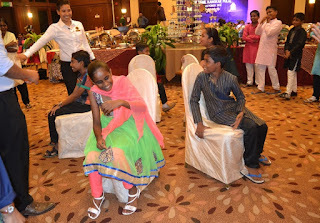 A sumptuous dinner buffet spread prepared by Executive Chef Ian Lim and his team gave the guests a delightful treat and the celebration continued with Indian traditional dances performed by the children. The celebration was at its height when resort staff as well as Soo responded to the invitation from the dancers to learn the dance steps and danced along with them! The fun went on for the children who played games led by the resort staff and many of them won stationery items as prizes. Speaking on behalf of the guests, the school’s senior assistant for the afternoon session, Madam Pushpam, thanked the resort and its staff for giving the children and their families a memorable Deepavali celebration experience at the resort. October is that time of year when all hotels under the Hilton Worldwide group take their hospitality skills into the community to make a positive impact on the people in the area where they live and work. The Hilton Global Month of Service is a signature annual volunteer program that celebrates the hotel group’s community engagement efforts with a month-long series of activities with the community every October since 2011. In the 2015 Global Month of Service, team members around the world completed more than 4000 volunteer projects in 92 countries in a total of 213,000 volunteer hours. This year the Hilton Worldwide group plans to make a larger impact on the community. “Since DoubleTree by Hilton Johor Baru opened just over two years ago, we have strived to uphold Hilton’s global commitment to corporate responsibility,” said hotel General Manager, Simon McGrath. “Travel with Purpose” is Hilton’s global corporate responsibility programme which is aimed at providing shared values with team members, guests, business partners and communities in which they live, work and travel. “This programme focuses on creating opportunities for individuals to reach their full potential, strengthening local communities and preserving the environment through the measurement, analysis and improvement of our use of natural resources,” he added. 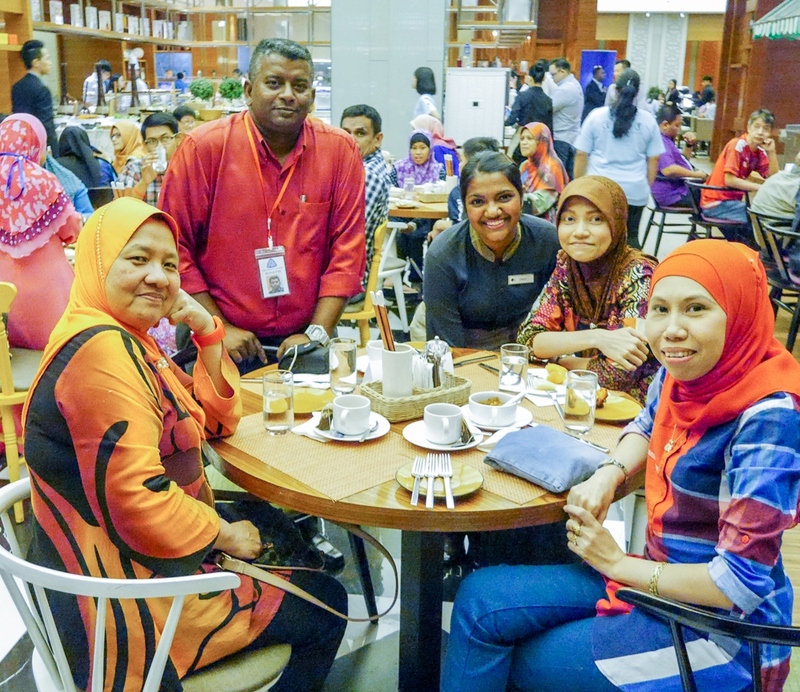 DoubleTree by Hilton JB celebrates the Global Month of Service through strengthening their existing relationship with Johor Area Rehabilitation Organisation (JARO) and the Rohingya community here. “In addition, the hotel will also support the Kechara Soup Kitchen by providing food for them to feed the city’s homeless,” said McGrath about the hotel’s commitment in this year’s community activities. “Our continued commitment to our “City Clean Up” activities will see our team members, set a positive example once again, as we pick up litter in the city center,” he added. The team had their share of fun on Oct 6 when they escorted a group of Rohingya children to an exciting outing at the Angry Birds Theme Park in KOMTAR JBCC. It was an unforgettable outing for 50 refugee children who enjoyed games and other interactive activities at the park. More than 200 students of Foon Yew High School attended a career talk held in their school premises on Oct 8 and benefited from Careers @ Hilton Live which introduced them to job opportunities and careers in the hotel industry. As a global leader in the industry, the Hilton Worldwide group strives to create a nurturing, collaborative and inclusive culture, and develop world-class learning and development programmes to enable youths to reach their career goals. Another Careers @ Hilton Live event is scheduled on Oct 25, where youths would be invited into the hotel for a similar career talk. As the hotel actively works to empower young people to achieve more through careers in hospitality, these student participants will have the privilege of a glimpse of the back-of-the-house operations for a better idea of what the various jobs with the hotel entail. Since its opening in 2014, DoubleTree by Hilton JB has provided a platform for JARO to sell their handcrafted quality products at The Food Store, the hotel’s café in the lobby. The hotel’s focus encompasses volunteering, creating awareness and advocacy for this local charitable organization. 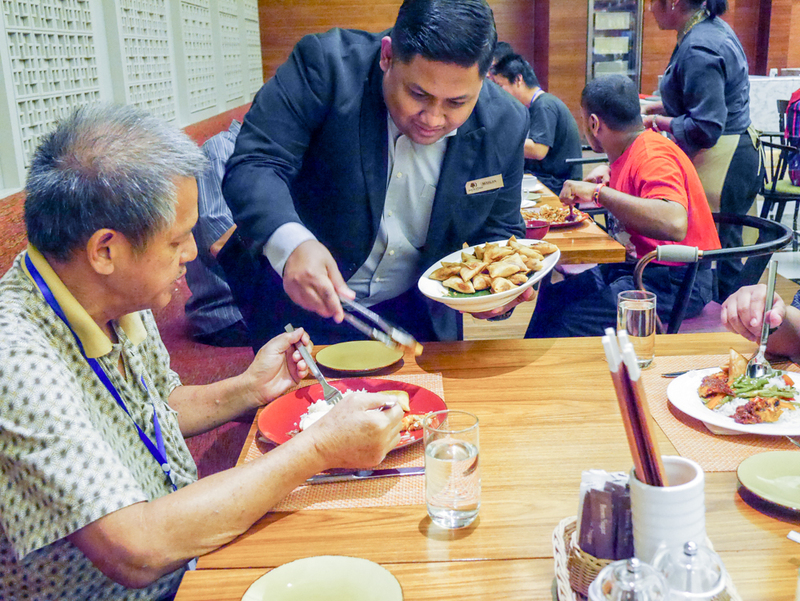 On Oct 12, the hotel hosted a sumptuous lunch buffet at the Makan Kitchen which was thoroughly enjoyed by some 50 staff and volunteers of JARO. Every Saturday in October, the team at DoubleTree by Hilton JB will pack 150 boxes of vegetarian food that will be distributed to the homeless through Kechara Soup Kitchen in their food donation effort. 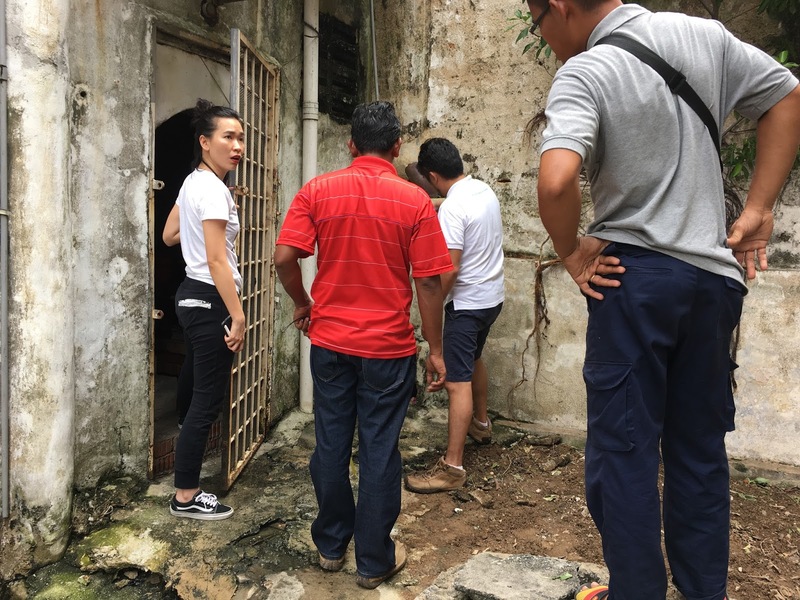 To top off the month’s series of community activities, the team at DoubleTree by Hilton JB will set a positive example in the community as the take part in a City Clean-Up event in the city center on Oct 28. This series of activities planned by DoubleTree by Hilton JB to enrich the community in October, will not only help the needy but certainly elevate those involved with a sense of purpose and CARE. Same Place, Same Rhyme was a drumming musical event held on the streets of Johor Baru’s heritage quarter which brought the 13th Johor Baru Arts Festival to a resounding close. Locals and tourists as well as music enthusiasts had a treat watching traditional percussion players come together to exchange skills and cultures in a special performance of Malay kompang with Indian and Chinese drums. After they have played their own traditional instruments, the percussionists exchanged their instruments and continued to perform along with violinists from Orkestra Darul Ta’zim. Gathered on Tan Hiok Nee Heritage Walk, in front of the Drums Café, the orchestra made up of adults and youths, joined the drummers for an interesting musical performance that went beyond all borders. Chinese drum played by an Indian drummer [Left] while the Indian drum was played by a Chinese drummer [Right]! Dancing on the street - Tourists and locals couldn't resist dancing to the feet-tapping music! Words cannot describe the eloquence of the musical harmony played by young and old from various ethnic groups who share the same passion in music. This is a reflection of the trust and harmony among people in every race group and from all walks of life, here. There’s no better way to share this beauty so we will let the pictures tell the story. The recently concluded 13th Johor Baru Arts Festival will be well remembered as the festival that first included wearable art, presented in an event headlined, Perspective: The Runway. As in all forms of art, the beauty and appeal of fashion, is highly subjective but the content curator, June Tang, did a fine job in an attempt to present an eclectic collection by local designers here and from our nearest neighbour, Singapore. When I studied the programme at the start of the festival and discovered The Runway, I made a note in my calendar to join fashionistas at this first-ever fashion event in the JB Arts Fest. It was always good to see what was trendy and what was back in style! My seat labelled by my name! Earlier on, my friends in the JB Arts Fest shared a photo taken during the setting-up of the runway in the ballroom of the DoubleTree by Hilton Johor Baru. I thought the shape of the hall was ideal for this event because the runway fitted nicely in the centre of the hall’s longish layout. It was a glittering evening where the Who’s who of style and fashion in JB gathered in the same hall to enjoy the creations of fellow artists. Not only did the ladies take the opportunity the come decked out in style but even the guys cleaned up pretty well! I hurried into the ballroom where the rows of seats that flanked the runway were almost all filled by guests and designers. I was directed to my seat there and was told that it had my name on it. Thankfully, the seats were numbered and with a little bit of help, I soon found it. Guests were to be seated by 8.20pm for the show to start upon arrival of the royal patron of the JB Arts Fest, Her Highness Tunku Tun Aminah Sultan Ibrahim, at 8.30pm. Poised and elegant, the Johor princess arrived and was escorted to her seat, accompanied by her sister-in-law and wife of the Johor Crown Prince, Che Puan Khaleeda Bustamam, who looked tall and slim in a soft, flowing gown in solid orange colour. The two-part runway show kicked off with models showing off collections by designers Seraphina S. featuring Rashid Anas for local menswear, A-Jane and Undefine featuring local brands, Nolixon (No Limit Zone), Supercrew and TNTCO as well as Singapore’s Ellysage. Undefine, a multi-branded streetwear concept store recently opened in Johor Baru City Square, carries local quality apparel under homegrown brands. While the models showed off comfortable street-wear, their cool outfits were matched by a range of footwear from the Crossover collection. Part one of the show came to a close with multi-award winning Andy Chan and team who presented a hair sculpturing demonstration on two models while a series of creative hair designs were paraded by a group of models. The focus may have been on their hair designs but my attention was riveted to the outfits the models were wearing. As they paused and posed on the runway, I saw how these dresses projected an image of modernity in an understated and distinct style. A quick check of the event programme confirmed that they were designs by Jean Lai under the label JL, which follows a simple design philosophy of achieving clean silhouettes, quality, craftsmanship and good fits. Taste is subjective and during the intermission, I mulled over the styles that were presented earlier and decided that for me, the more wearable pieces of art must be the Ellysage and A-Jane designs. I particularly liked the flared skirts and uneven hem lengths in the outfits by A-Jane. The second part of the showcase featured designs by Glancez, Bev C, Al-Kaftan and from Singapore, Ying the Label. The casual and sporty collection by award-winning contemporary fashion label based in Hong Kong, Glancez, by Malaysian Zera Ng, was in stark contrast with the flamboyant styles of homegrown designers, Beverly and Cally under their Bev C brand. Al-Kaftan which simply means The Kaftan in Arabic, is a Johor-based designer brand by a mother and daughter team. Zahara Aljunied and her daughter, Amal Alkaff, who are avid fans of the kaftan, design and produce kaftans in one-of-a-kind designs at affordable prices. Ying the Label, also offered one-of-a-kind patterns that are transferred onto fabrics from her paintings, origami and embroidery designs. Believing that art can transcend into everyday wear, the resulting artwork of this label are subtle yet surprising. As the models paraded the merits of each design to the beat of mesmerizing music, I admired how each outfit was displayed to its best advantage. All too soon, the show was over and guests filed out to the foyer to visit the pop-up stalls set up by the designers and mingled with the designers and models. All the hard work in preparing for this event paid off handsomely as the 13th JB Arts Fest successfully pulled off their first wearable art, fashion runway event! Gathered inside The Black Box, an arts complex in the Mall of Medini, Johor Baru, the audience waited with bated breath to catch a rare live performance of Japanese Bunraku and Teochew “iron-rod” puppets in an Asian Traditional Puppet Exchange, which was being staged here for the first time. 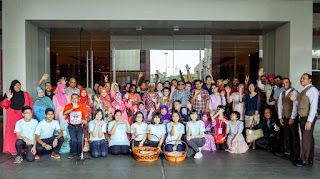 This cross-cultural exchange, which took place recently, was an initiative of Johor Baru: International Festival City in collaboration with the Japan Foundation, Kuala Lumpur. It brought together Malaysia’s Kim Giak Low Choon Teochew Puppet Troupe and Japan’s Ningyojoruri Bunrakuza to present an elaborate showcase complete with workshop and demonstration of puppetry techniques. Headlined, Red, Hot, Furious Love: The programme lineup featured Teochew puppets performing excerpts from The Love of the Celestial Fox with an intermission before the Bunraku puppets performed excerpts from The Red-Hot Love of a Greengrocer’s Daughter. The art of Teochew iron-rod puppetry originated in the Central Plains of China as shadow puppets. Made of dried leather strips and controlled by three long iron rods attached to the arms and torso, these were only two-dimensional shadow puppets. During the Southern Song period (circa 1127 – 1279) refugees fleeing from economic instability and barbaric invasions, brought the art to the Teochew region in Guandong. This art-form then adopted many aspects of the rich operatic traditions here. Since the Qing dynasty (17th century), these shadow puppets experimented with removing the white screen (usually paper) between the audience and the puppets to improve the show’s visual impact. So the puppets became visible to the audience. With better audience dynamics, the puppets were improved to maximize this advantage. Later the puppets became three-dimensional, first by using hay for the bodies before graduating to more robust wooden bodies. Throughout its evolution, the puppets have retained their traditional method of control since its shadow puppet era, using three iron rods. This unique feature earned the Teochew puppets its classification as iron-rod puppets. Helmed by Ling Goh, fourth generation opera thespian and curator of the Penang Teochew Puppet and Opera House, the troupe is one of the last of its kind in the country. In 2008, they were the proud recipient of the Penang Intangible Cultural Heritage Award. In the 19th century, economic hardship in China drove immigrants to seek better fortunes abroad and many Teochew arrived in Singapore, the Riau Islands and Malaysia. Among them was Goh’s great-grandfather who brought his opera troupe from Teochew province to Singapore. The Lao Sai Yong Feng Opera Troupe became the first opera troop in South East Asia. They travelled and performed across Malaysia, Singapore, Thailand and Indonesia before settling in Penang. While Goh’s grandfather inherited the opera troupe, her parents mainly performed puppet shows. As their focus shifted to puppetry, the troupe was renamed Lao Rong Xiu Chun Puppet Troupe. Goh and her siblings, who grew up in this artistic environment, had a natural interest in this art-form and she started to perform puppet opera at the tender age of seven. Working with her brother, Goh Lih Shan, to promote the art of Teochew puppetry, their troupe was renamed, Kim Gaik Low Choon Teochew Puppet Troupe and they opened the Penang Teochew Puppet and Opera House at Armenian Street. Goh says their performances remain true to authentic Teochew puppet shows but to improve their presentation, she modified the stage into a semi-circle. The latest addition to their shows are English subtitles projected onto a screen to improve the viewing pleasure of non-Chinese audiences. It’s fascinating to watch the troupe perform their respective parts, manipulating the iron-rod puppets, playing musical instruments, speaking animatedly and singing various roles, to bring to life the dramatic story of The Love of the Celestial Fox. Passionate about passing down the art to future generations, Goh is pleased that her niece and nephew have shown keen interest and are actively participating with the troupe to gain more skills and experience. Their opera house which holds workshops, has attracted interest from opera enthusiasts who wish to train with her. She’s also thrilled that the exposure the troupe is receiving through performing at art festivals and to non-Chinese speaking audiences, has garnered fresh interest in this traditional art-form. Ningyo Joruri Bunraku puppet theatre, a blend of sung narrative, shamisen music and puppet drama, ranks with noh and kabuki as one of Japan’s foremost stage arts. This theatrical form emerged during the early Edo period when puppetry was coupled with joruri, a popular 15th century narrative genre. Bunraku, a 300-year old dramatic art-form, is designated by the Japanese government as an Intangible Cultural Property and by UNESCO as a World Intangible Cultural Heritage. This art-form involves three puppeteers or ningyotsukai, dressed in black to render them invisible against a dark background, to manipulate a single large puppet. The spell-binding appeal of bunraku centers on the skills of the puppeteers manipulating lavishly costumed large puppets to the vocals of a single chanter or tayu who expresses the dialogue and emotions for all characters in a script. Meanwhile a shamisen player enhances the mood through his three-stringed lute. One of the main features of the bunraku puppet is its wooden head which is hollowed out and fitted with a mechanism made of bamboo for the lead puppeteer to manipulate. His skillful hands would transform the puppet’s facial expressions through its eyebrows and eyeballs movements! The plots for bunraku are derived from two main sources: historical plays set in feudal times (jidaimono) and contemporary dramas that explore the conflict between affairs of the heart and social obligation (sewamono). The aesthetic qualities and dramatic content of the plays continue to appeal to modern audiences and Bunraku continues to attract young performers. This performance in JB marked the fourth time this troupe has visited Malaysia to share the art of Bunraku here. In 2013, it presented South East Asia’s first full-scale bunraku performance in Kuala Lumpur. The following year, it returned to Kuala Lumpur for a joint puppetry demonstration with a wayang kulit troupe led by Kamarulbahri Hussin. Bunraku made its debut performance in Penang during the inaugural Butterworth Fringe Festival in 2015 and shared the stage with local practitioners of Potehi glove puppetry. Before coming to JB for this cross-cultural show, the Osaka-based troupe performed in New Delhi, India, and continued their tour to Manila in the Philippines. Handcrafted from wood, clay and paper, Goh said their Teochew puppets have increased in height from 20 cm (8 inches) to 45 cm (18 inches) so that audiences can enjoy a better view. Demonstrating how they’re manipulated, she explains that Teochew puppets use left-hand control to support the puppet’s weight while the iron rods serve to move the puppet’s hands. After bunraku chanter, Yoshihodayu Toyotake, impressed the audience with his demonstration of a range of emotions that were enhanced by music from the shamisen player, he encouraged audience participation in expressing various emotions like laughter and tears. Lead puppeteer, Minoshiro Yoshida, and two other puppeteers demonstrated various synchronized movements to manipulate a single bunraku puppet and explained that the lead puppeteer was identified by his special pair of slippers. For the cultural exchange, puppeteers from the two troupes had the opportunity to learn more about each other’s craft as they switched roles to try performing with puppets belonging to the other troupe. It was indeed an eye-opening performance and I was thrilled to learn so much about these arts of puppetry as well as discover that in bunraku, three puppeteers would manipulate a single puppet while in Teochew puppetry, a puppet is manipulated by one puppeteer using three iron rods. Sidang Teater, a street-style theatre competition, was held in a 3-day programme that showcased six independent theatre productions during the recent 13th JB Arts Festival. This event aimed to bring theatre enthusiasts together, engage with the communities in the city and to tell stories with shared community values and ideals. Organised by Sekutu Ghuraba, two productions were featured in a competition at 7pm held over three days in early October. Each day’s event started from 3pm for the Dry Tech set-up where the technical crew familiarized themselves with the equipment and flow of the performance. This was followed by workshop sessions at 5pm, conducted by veterans in the theatre industry that focused on scriptwriting, directing and acting. Now take a closer look at this shot taken during a workshop session on one of the evenings. In the center, you will see the presenters seated on a small stage against a backdrop decorated by live plants. Participants are casually seated in a rustic setting, on floor mats, wooden crates and benches. Take an even closer look at this shot again and try to identify this place which is situated in the heart of Johor Baru’s heritage quarter. This place was listed as, “the pop-up park” in the festival programme but there was no definite address to this location. If you are familiar with the city’s heritage quarter, you may recognise the red wall on the left. It is the rear wall of what is popularly known as the Red House on Jalan Tan Hiok Nee and the opposite wall painted in green, is the rear wall of It Roo Café on Jalan Dhoby. 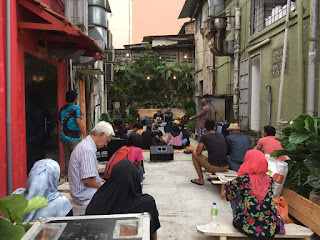 By now you would have figured out that this pop-up park is located along Jalan Pahang, within the back lane between the Red House and It Roo Café. While space was limited, the acoustics was good and it served as a compact theatre for the Sidang Teater event. Now who would have thought that a back lane could be designed into a pop-up park where the community gathered to enjoy a series of theatre shows? But for three nights during the JB Arts Fest, huge crowds gathered to enjoy the six theatre productions presented here, in the heart of the city’s heritage quarter. For a long time, back lanes were misused as dumping grounds, dirty and abandoned, and where drivers parked their cars illegally. To create more space in the city, the clean-up project and use of this space as a pop-up park for the JB Arts Fest, was an initiative of ThinkCity Johor Baru. The objective was to carry out a pilot project at one site, test out possible solutions and showcase community efforts to activate such underutilized spaces. This place-making exercise was accomplished with the cooperation of relevant stakeholders including those occupying the adjacent buildings and nearby businesses. ThinkCity’s Laneways Improvement initiative was implemented under the Johor Baru Transformation Programme in partnership with the MBJB or JB City Council and Iskandar Regional Development Authority (IRDA). The project started with a discussion of the work-plans with a group of stakeholders in ThinkCity’s office, which happens to be also located along Jalan Pahang. Conducted by ThinkCity’s Programme Manager, Daniel Lim, the stakeholders were given a clear idea of how the project was going to be implemented. 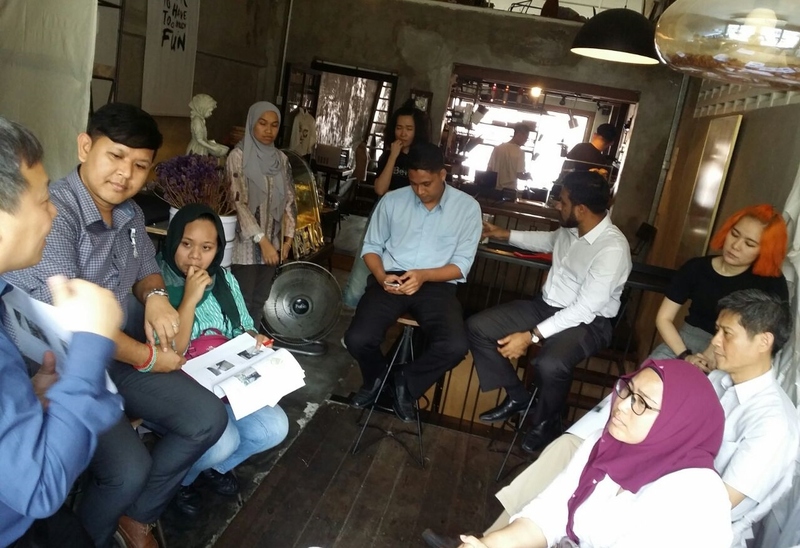 This was followed by another discussion with representatives from MBJB, IRDA and the stakeholders on the design of the pop-up park conducted by ThinkCity’s Chief Operating Officer, Dr Neil Khor. Once the relevant stakeholders understood what the project entailed, they had an onsite discussion to iron out further details. On Sept 22 the team from MBJB were at the site to flush out the drainage system as well as give the laneways a general clean up. The site for the pop-up park was given priority and work commenced earnestly to resurface the flooring with a fresh coat of concrete. Together with MBJB, the community and ThinkCity, the first pop-up park in a back lane was designed and implemented for the 13th JB Arts Festival. In a matter of days, a small stage with a backdrop decorated by fresh plants was completed and this created a cosy ambience for the Sidang Teater events. “This is the first step in ThinkCity’s effort to rejuvenate the laneways,” said Lim who was clearly pleased with the outcome of this pilot project. ThinkCity, a city-making institution that supports the evolving urban landscape and seeks ways to make our cities more innovative, resilient and livable, has led the way in helping us reclaim our city’s back lanes. As we reclaim our back lanes under their Laneways Improvement project, the community must continue to participate in cooperation with MBJB, IRDA and ThinkCity to maintain our laneways as they progress with their comprehensive, integrated and inclusive plan to rejuvenate our city and make Johor Baru a more livable and walkable city.